Shower units from Aquaart line are perfect showers for modern bathrooms and offer a full shower experience. 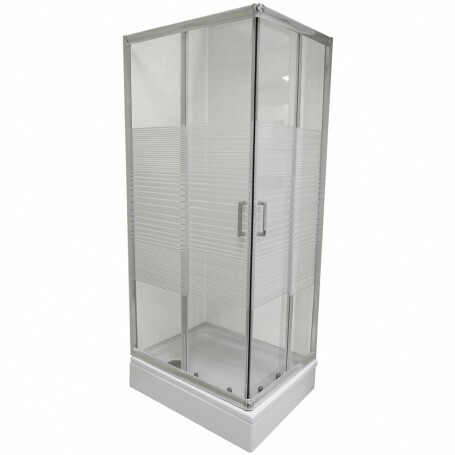 The price includes shower Ibiza with shiny silver aluminum profiles and tempered 6mm thick glass and shower tub Carmen height of 15 cm (Siphon not included in the price and can be ordered separately). Aquaart Carmen shower is Croatian product made of cast sanitary acrylic that guarantees longevity and beauty of shower trays, its lightweight, have very good heat and sound isolation, easy to maintain and resistant to mechanical damage, finish shower trays made of no slippery layer and comes with ten years factory warranty. Shower Ibiza with highest quality and aesthetic top class showers will attract attention in your bathroom. Affordable price with high quality guarantee is the right choice for your bathroom.